I believe in the 1942 entry the Marg that Grama refers to is Marie’s friend, Margie. The 1943 entry was strange. Grama thought Marie would be home and made her a cake and a lovely fried chicken dinner. Why the cake? Marie’s birthday was just three days prior to this event and the whole family had eaten out in celebration. 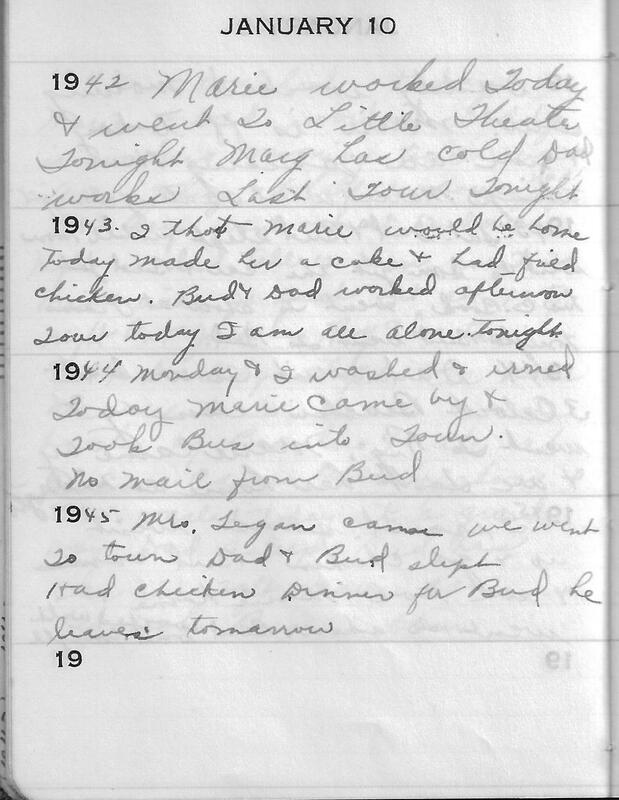 The January 7th entry made no mention of a cake so perhaps Grama was making it up to her today. Sad that, for whatever reason, Marie did not come by. Today, we would expect that Marie would have called to say she couldn’t come or Grama would have called to ask if she was coming but they very well might not have had a telephone in either house so they couldn’t communicate that information.